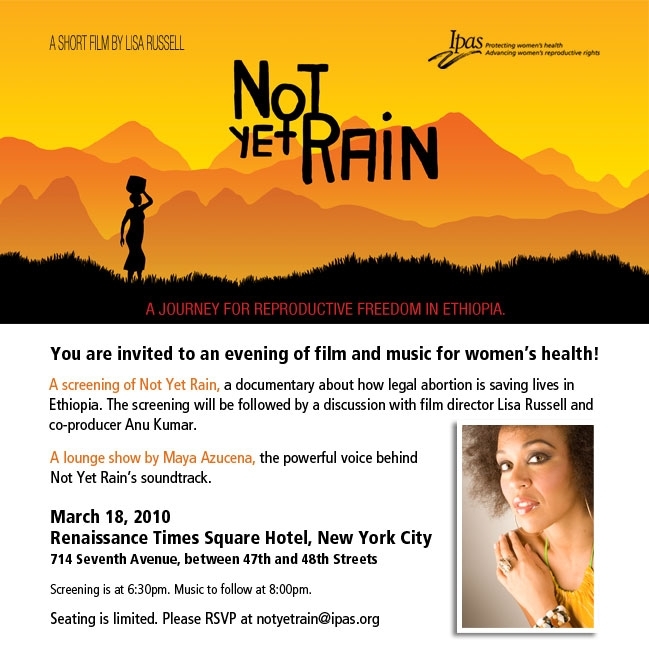 Lisa Russell and IPAS invite you to an evening of film and music for women’s health. Click here to learn about MDGfive.com, a new project that Lisa and Maya are working on. They are calling on creative communities to use their artistic skills to raise awareness for the issue of maternal health. Doctors in Nicaragua refuse to provide Amalia, a Nicaraguan woman with a ten year old daughter, with the care that she needs to fight her cancer. Chemotherapy could save her but it might also harm or lead to the death of her baby—and doctors fear legal consequences of performing a therapeutic abortion. This article explains how the revised penal code (that stipulates prison sentences for girls and women who seek abortion services and for health professionals who provide abortion services) is inconsistent with Nicaragua’s Obstetric Rules and Protocols that are issued by the Ministry of Health. The article also tells Amalia’s personal story, putting a human face on the issue of access to therapeutic abortions in Nicaragua. Click here to read Amnesty International’s report on the abortion ban in Nicaragua–and watch a short video on the issue.